COLUMBUS, WI –On Sunday afternoon, April 15, 2012, the air was filled with gratitude and appreciation in Columbus, WI. 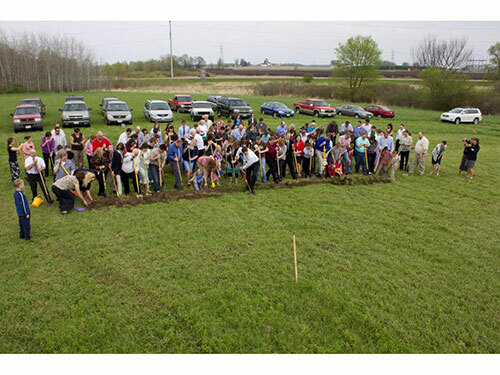 The groundbreaking ceremony for the New Testament Baptist Church began with a reading from Assistant Pastor Chris Blevins, while members of the congregation eagerly grasped their shovels for the countdown to breaking ground. “It was important to build a new church due to the expanding congregation,” says Assistant Pastor Chris Blevins. On any given Sunday, the church is packed with anywhere from 150-180 people for Sunday morning worship. 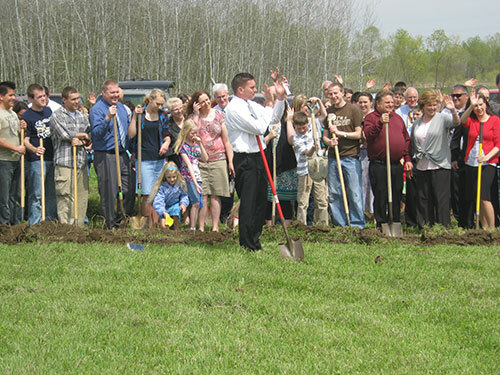 With families growing and new members arriving, the church desperately needed a larger building. That is when the church paired with Continental Baptist Missions (CBM), a church planting agency that includes a volunteer Missions Building Ministry, and General Engineering Company to begin the process of constructing a brand new church. Starting from humble beginnings in 1977, New Testament Baptist Church has consistently grown under the leadership of three different pastors. Their current Senior Pastor, Todd Werner, was not able to attend the groundbreaking celebration due to health reasons, but Assistant Pastor Chris Blevins, and the current board of deacons stepped in and did a marvelous job of making the event a memorable one. The New Testament Baptist church is currently found at 342 N. Lewis St. in Columbus, the new church building will be located on Duborg Road just off of Hwy 16, overlooking the beautiful countryside of Columbus, WI. Phase one of the new church will be 11,000 square feet in size, with ample space to suit the ever-growing congregation. Completion of the new church building is set for fall 2013.